This car game, which pits armored vehicles against each other in a brutal fight to the finish, is now available to download for free on the App Store. Players can choose between a range of weaponized vehicles and customize them before racing through dangerous environments where the rules are simple: the last driver to survive wins. 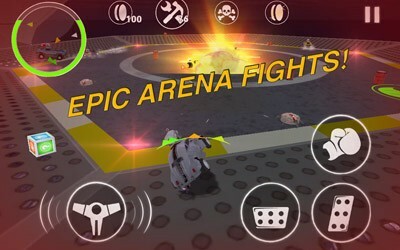 Featuring a powerful state-of-the-art 3D engine which combines 2 different game modes (drag race and a demolition arena), players use a variety of devastating and exotic weapons to destroy their enemies such as the punch launcher or explosive barrels. In addition to racing through desert and on an aircraft carrier in the middle of the ocean, Nitro Punch has now added avast new arena which pits the cars against each other in an Aztec temple defended by a Stone Guardian. The vehicles will also be able to knock each other over into the lava pits which surround the temple. Apart from offering a brand new level to race and battle through, Nitro Punch 1.4 will also have more cars to choose from than ever. A new Jeep has been added to the already extensive fleet of monster trucks, cruisers and formula one cars available for combat. The Nitro Punch car game is currently ranked among the top 20 most downloaded racing apps in 8 countries within the Middle East (Saudi Arabia, Jordan, Bahrain, Egypt, Algeria, Oman, Tunisia and Israel).